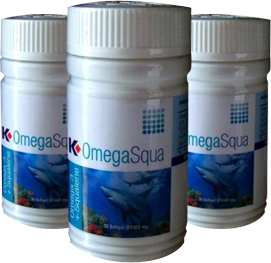 K-OmegaSqua consists of Omega 3 from Norwegian salmon, Squalene from shark's liver oil that live in the Pacific Ocean and Natural Vitamin E to improve the health of our body. Lowers down cholesterol and stabilizes heart pressure. Reduces inflammation and joint pains. Removes toxins such as pesticides and heavy metals. Omega 3 - Omega 3 (EPA 40%, DHA 30%), is sourced from Norwegian salmon that is rich in Omega 3 by 70% where the EPA is 40% and DHA is 30%. The function of EPA is to enhance blood circulation, reduces fat formation at the liver and reduces cholesterol level, DHA provides nutrition for the brain..
Squalene - Squalene helps to increase oxygen level in the cells and improves the skin. It is produced from liver oil of deep sea sharks that live in the Pacific Ocean within 600-1000 meters deep where there is no sunlight and the water pressure is very high.